ApartmentRatings.com is a website that allows users to post reviews of apartments they have lived in or worked with. This website was founded over 15 years ago in Austin, Texas. The website claims to be a completely unbiased source of information about various apartments around the United States, and doesn’t allow advertisements from anyone who acts as a landlord. Users that leave or respond to reviews may do so for free. Landlords or property owners must pay for a premium account in order to respond as a Verified Manager to any review. Currently the company is based out of California, and is owned by the Internet Brands, Inc. corporation. According to their website, they are in the Top 5 most-visited websites for apartment hunters in the United States. There’s no question that relocating can be stressful enough without finding out a month into your new move that your apartment comes with some disappointing features. ApartmentRatings is a website that allows users to search through reviews of apartments from people who have lived there. You can search by the city, and then narrow it down to specific units, to see the reviews. Each listing shows the average price of a unit, followed by the average unit size. Reviewers can upload pictures to give potential renters even more information about the real views they can expect to find. Additionally, any building or set of units with enough ratings will display a percentage next to the name that shows what percent of reviewers recommend living in the unit. This is an easy way to quickly skim through units, choosing only the places that are highly recommended. Users rate units based on the noise levels they experienced, how safe they felt in the neighborhood, how timely and professional the maintenance crew or groundskeeper was, how well the grounds were kept, and how friendly and professional the office staff were. One major downside to the website is that is not secured. For most users this isn’t a problem; however, landlords or property owners who must enter payment information in order to be represented as a Verified Owner may not feel comfortable with the lack of security. You do have to create a membership in order to utilize all of the free features, but you can browse through the basic information without it. 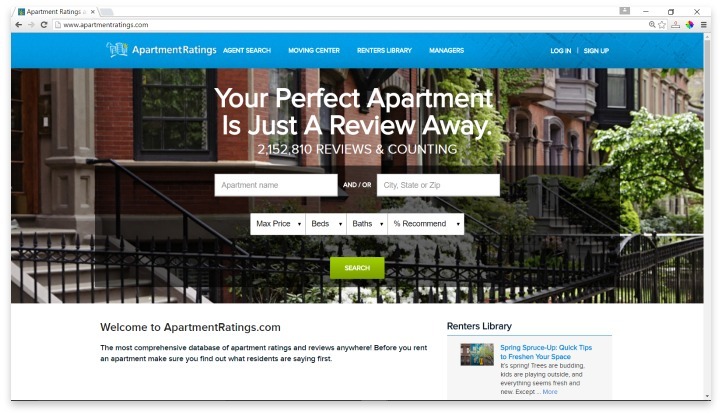 ApartmentRatings.com allows users to search through reviews of apartments from people who have lived there. You can search by the city, and then narrow it down to specific units, to see the reviews. While it’s true that any reviewer could be lying, that is something that most Internet users have become savvy at recognizing. If users keep in mind that these are no more than the garden variety Internet reviewers, the same as they’d find on sites like Amazon, ApartmentRatings could be a very useful tool. If you’ve already narrowed your choices down to a few buildings within a specific city, you lose nothing by checking it out on this site, and the information you gain could be the difference between a wonderful next home, or a year-long nightmare in the making. Have you had an experience with this company? Please share your ApartmentRatings.com reviews below.